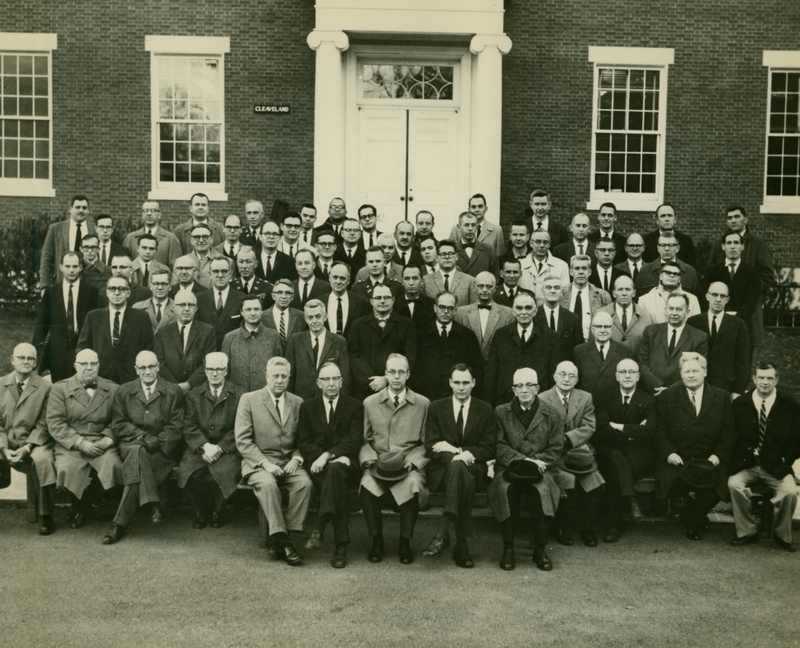 Group portrait of the faculty in the fall of 1962. Left to right, front row: Morrell, Wilder, Holmes, Boyer, Little, Kendrick, President Coles, Greason, Hammond, Catlin, H.R. Brown, Koelln, Harwell. 2nd row: Abrahamson, Thayer, Pols, Root, Geoghegan, Chittim, Helmreich, P.M. Brown, Korgen. 3rd row: McKee, Lysenko, Coxe, Riley, Taylor, Ryan, Kamerling, Beam, Daggett, Dickerson, Coombs, Sterling, MacFayden, Bailey, Shaw, Beckwith, Ladd, Storer, Gustafson. 4th row: Nunn, Hodge, Warner, Lubin, Ryan, Friedman, Petrie, Toft, Christie, Hazelton, Cornell, LaCasce, Hiebert, Darling, Hussey, Sabasteanski, Huntington, Hathaway, Brower, Kamber, Thompson, Leith, Barnard, Fleming, Von Hendy, Royster, Calder, Mikaelian, Fuchs, Mayo, Fernald, Corey, Kostacopoulos.